Prices from £300 - Phone us for offers. Danny Cottage lies back from a quiet country lane only ten minutes walk from the village square of Alfriston. Alfriston, one of the prettiest villages in England, has houses dating back to the 14th century including the Old Clergy House, the first property bought by the National Trust for just £10.00. The magnificent church is known as the ‘Cathedral of the South Downs' and is set on the banks of the Cuckmere River which meanders its way three miles coming in to the sea at the bottom of the breath taking Seven Sisters' cliffs. 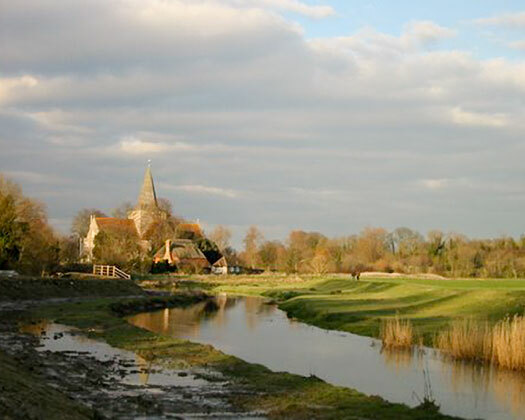 Smugglers used the river in the 18th Century to transport their contraband inland to Alfriston for distribution around the country. The village still boasts three pubs - smuggling was thirsty work! 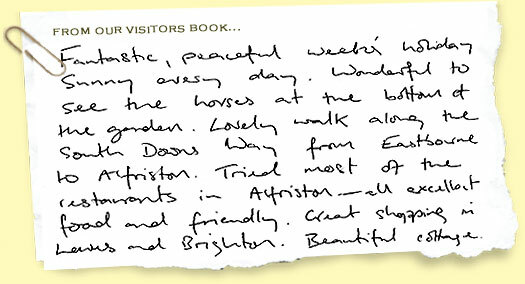 The Cuckmere Valley appeals to visitors with a variety of tastes and interests. Alfriston's shops are all independently owned and answering most needs and offering gifts for all occasions. 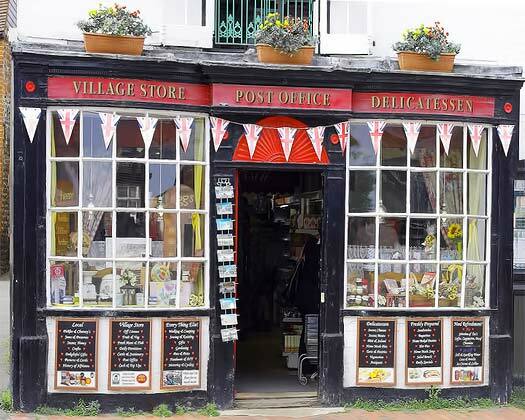 Alfriston Village Stores and Post Office (01323 870201) is excellent and sells fruit and vegetables, local fish and meat, freshly baked bread, pies, pastries and a wonderful selection of Sussex and other cheeses. It also has an off-licence and the Post Office counter is a cash point. Also well stocked and with its own butcher is Berwick Stores (01323 870200) near the Berwick Station. A few minute's drive to Seaford and you will find Paul's Plaice which sells an impressive choice of fish - much of it local. Morrison's is the main Seaford supermarket but there is also a Co-op and news agent. Hicks, the News Agent, apart from daily newspapers, sells a wide range of goods from toys to aspirins. Diana Kelly Interiors with an ever changing stock of quality antiques. Steamer Trading Cook Shop has won endless awards including Houseware Retailer of the Year 2011. It opened in Alfriston in1985 and now has 26 shops nationwide. Much Ado Books with new and old books is housed in a charming old building and won Bookshop of the year in 2007. 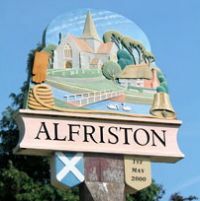 Alfriston Gallery has original paintings of Sussex scenes and beyond and limited addition prints. Music Memorablia sells music of yesteryear. The Apiary sells fine women's clothing from Peru. 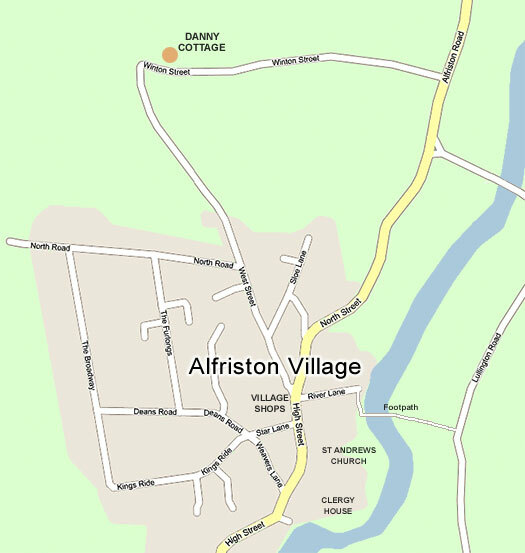 Also, Alfriston has two hairdressers and a beauty therapy salon (01323 871001). Danny Cottage is the perfect base for walking offering some of the best hiking and riding country in England. From a 15 minute stroll across the fields to Alfriston or an hour's walk to any of 6 country pubs all selling good food, to two hours or more across the downs to Jevington in the east passing the Long Man of Wilmington, or, to Firle Village to the west and another pub that serves a great lunch. There are three long distance trails that take days to complete. 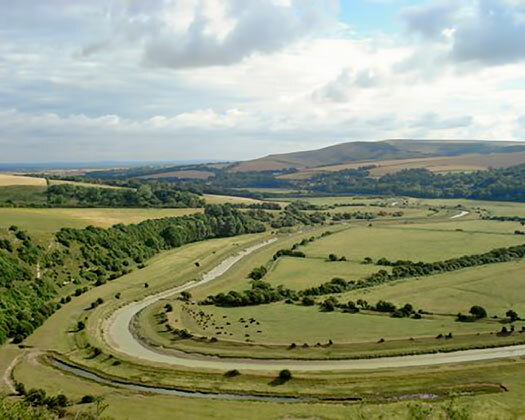 The South Downs Way runs for 100 miles (161 km) from Eastbourne to Winchester, The Vanguard Way (66 mile or 107km) from Newhaven to East Croydon, and the Wealdway (82 miles or 132km) from Eastbourne to Gravesend. All these trails pass within minutes of Danny Cottage so you can dip in and out and enjoy the walks for as long as you want. www.ldwa.org.uk . Danny Cottage book shelves have several guides and books from which to pick your route. There are opportunities for both sea and freshwater fishing and boating, riding, golf, gliding, cycling, swimming and tennis. 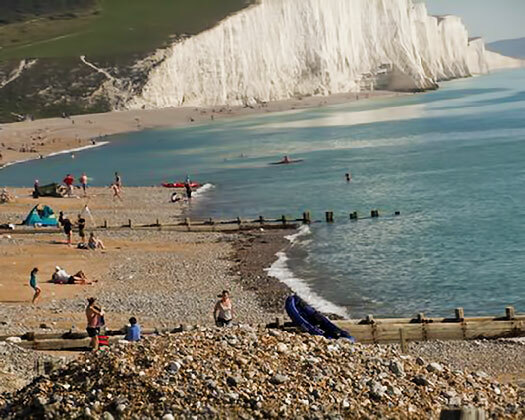 For all the fun of the traditional seaside people head to Brighton, Eastbourne or Hastings, however, quieter parts of the seashore are found at the mouth of Cuckmere Haven where the river meets the sea between the huge white cliffs of the Seven Sisters and Seaford Head or you might prefer the heated pools in Seaford, Newhaven or Eastbourne. There are five excellent downland golf courses within half an hour's drive. For a gentler but rewarding pursuit bird watching is always popular so bring your binoculars. The Alfriston Clergy House www.nationaltrust.org.uk was the first house bought by the National Trust. It is a beautiful medieval cottage with a pretty garden and well worth a visit. The Long Man of Wilmington, a 250 foot high figure carved into the chalk hills, is shrouded in mystery but seems to be standing guard over the residents of the villages in the valley below. One of the smallest churches in England seating only 14 people is at Lullington and is where the actor Dirk Bogard as a child lived in the house next to the church and later wrote his reminiscences in the best seller ‘A Postillion Struck by Lighting'. This and other books by local authors are on the shelves in Danny Cottage. Charleston Farm House www.charleston.org.uk was the wonderfully painted home of Vanessa Bell and Duncan Grant and was regularly visited by her sister, Virginia Wolfe, and all the other notorious Bloomsbury group. Nearby Berwick Church was painted by the group during the war. Firle Place www.firle.com , the home of the Gage family for 500 years including General Gage who lost the American colonies as a result of the Revolutionary War, houses a wonderful collection of paintings, china and furniture. It is a 10 minute drive to moated Michelham Priory www.sussexpast.co.uk , founded in 1229, with its working watermill and peaceful sculpture garden. Not all these attractions are open daily so check for opening times and days. 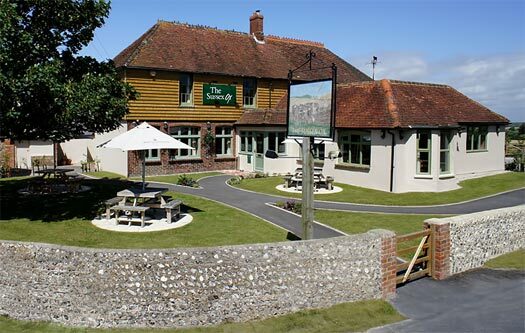 Alfriston has three pubs, The George Inn has a comprehensive menu, The Star Inn and The Smugglers are popular drinking pubs and two top class restaurants at the Wingrove and Moonrakers. The Tudor House Restaurant is good for lunches and dinner as well as afternoon tea. There are three more tea places (as well as all the hotels who serve teas) in the village, the most popular being Badgers. Not far from Alfriston are several more pubs and tea gardens, in walking distance. If you want a hike of under two hours, you will find the Giants Rest at Wilmington, The Sussex Ox at Milton Street, The Cricketers at Berwick, The Rose Cottage Inn at Alciston, The Ram at Firle, and The Tiger at East Dean. 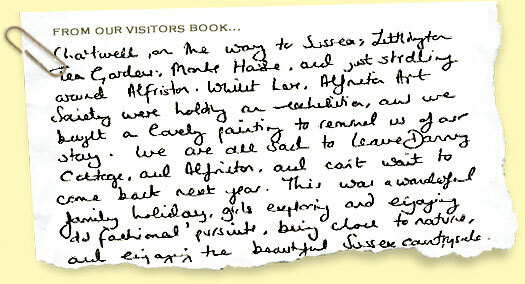 For tea, Litlington Tea Gardens, Exceat Farmhouse, and Wishing Well Tearooms are all worth a visit. 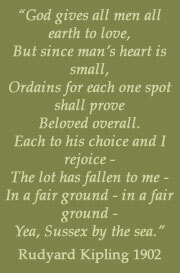 In 1406 Alfriston was presented with a Market Charter. Today there are many gift shops to browse through and a traditional Village Store selling a wide range of produce, including fresh local vegetables and meat and a great variety of gifts too.